Life has never been easy for Anya Balanchine. Living in the year 2083, she's the orphaned daughter of New York City's most infamous crime boss, who made his fortune on the illegal production of chocolate, which, along with caffeine, has been outlawed. She and her siblings get by—just barely—by staying out of the family business that has wreaked so much havoc on their immediate family, but Anya is dragged into it when her ex-boyfriend is poisoned by one of her family's chocolate bars. Suddenly, her family's dealings are unavoidable, and Anya is forced to make some decisions to keep her family safe that don't always put her on the right side of the law—an especially complicated thing when she's falling for her new classmate, Win Delacroix...who just happens to be the assistant D.A. 's son. All These Things I've Done is a spectacular, incisive novel with an unforgettable narrator. Anya Balanchine is a very passionate, strong, and driven person. She's taken care of her siblings and her grandmother for years, and she's willing to do nearly anything for them. One of the sources of conflict here is Anya's adamant denial of her place in the family's business, even as she is slowly dragged into its dealings in order to protect the interests of her siblings. Another is her relationship with Win Delacroix, whose personality and quirks are pretty irresistible, but whose background complicates things considerably. Anya finds it hard to deny her attraction to him, but holds back on getting involved with him out of loyalty to her best friend, the vibrant Scarlett, and Win's father's position as assistant D.A. All of this drama plays out in a crumbling city riddled with underground nightclubs and coffee speakeasies in what were once museums and other points of interest, where danger is everywhere. All These Things I've Done can be pretty intense at times as Anya is taken through the corrupt court system and has a few close calls in her elaborate schemes, but those elements give this story an alluring and suspenseful edge. All in all, this is a wonderful novel, written in precise, affecting prose with a narrator that is sophisticated, yet relatable. 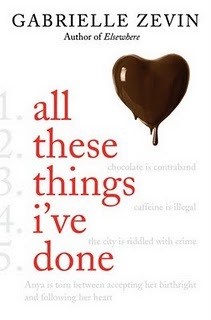 All These Things I’ve Done is one of the best books of 2011. Cover Comments: I love the chocolate covered heart, the layout of this cover, and the way the title is formatted in a list. So. Perfect. This one will be available on September 27th, 2011. I'm so glad you liked this one. I'm up and down with Zevin - I liked Elsewhere, didn't like teenage amnesic - so I wasn't sure about this book, but your review totally tipped the balance toward the "Buy" side of the spectrum. I love when authors draw attention to the difference between our own world and the world portrayed in their books by taking something we are so accustomed to-like chocolate-and dealing with it in a completely different way. The fact that this phenomenon is able to evoke awe from humanity shows how releuctant to change we really are. Do you agree? Also, please check out my blog at wwww.meditationsofateenagephilosopher.blogspot.com. This is where I take philosophical themes from books and apply them to life-enjoy! This one sounds so interesting, and I love Gabrielle Zevin. She has such a wide spectrum of topics in her books. I mean, chocolate and caffine banned? Who would've thought! Thanks for the glowing review! This sounds really cool. Thanks for posting.